In the morning we went to Philippine Consulate General that is located at 161 Eglinton Avenue East Toronto, Ontario. After our transaction there we proceed to Eaton Centre Mall, we eat our lunch and then go shopping. I only bought a new bag, a nice one and the brand is Aldo. It's only 58 bucks and I love the color. I bought this bag for our next travel adventure at Niagara Falls on Saturday of course with Ermz and her best friend Glory. 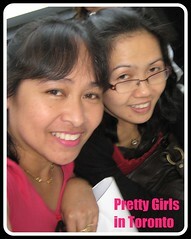 After our shopping we rest for a while waiting for my car, hehehe. While waiting we take pictures. I arrived home around 8 in the evening.